Yesterday, I shared that I'm officially (by 0.2 pounds, but whatever) the smallest I've ever been. I was trying to think back to when I might have been this size growing up and my best guess is somewhere around 5th grade. That seems crazy, doesn't it? Age 11. I wore a size 12 dress to my sister's wedding. I remember my grandmother making a comment about the dress looking nice and my mom saying it was a size 12 from the women's department because I'd 'outgrown' kids clothes. Which was really just a euphemism for being too fat for kids clothes. I remember being proud that I got to shop with the grown-ups. Age 21. I wore a size 20 dress to a college ball. I *hated* dress shopping for that event. Everything I tried on was too small, or made for an 80 year old. I settled on the most boring dress in the world because it fit and it didn't look like it was for an old lady. Then I insisted on wearing a wrap around my arms to hide them. Body issues = out of control by then. I think it would be fascinating to go back in time and try on these dresses again. 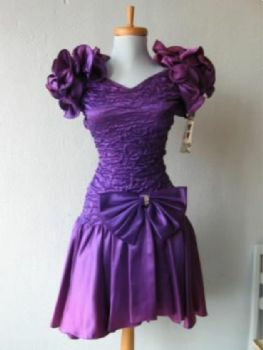 Especially the purple ruffly one because in hindsight that dress was hilarious.